A new report from researchers at Oxford University argues that large dams are a risky investment - soaring past projected budgets, drowning emerging economies in debt and failing to deliver promised benefits. Do they ever really make sense? 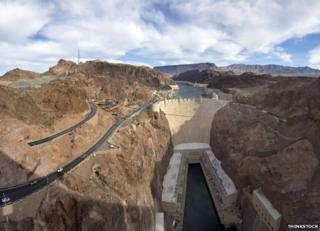 A peek over the edge of the Hoover Dam's 60-storey wall is enough to send shivers down anyone's spine. Constructed from enough concrete to pave a motorway from New York to San Francisco - this colossal barrier is touted as a symbol of man's mastery over nature and a marvel of 20th Century engineering. The dam was credited with helping jump-start America's economy after the Great Depression, reining in the flood-prone Colorado River and generating cheap hydroelectric power for arid south-western states. Even more miraculously, the Hoover Dam was completed two years ahead of schedule and roughly $15m (£9m) under budget. But for megadam critics, the Hoover Dam is an anomaly. The Oxford researchers reviewed 245 large dams - those with a wall height over 15m (49ft) - built between 1934 and 2007. They found that the dams ran 96% over their approved budgets on average - Brazil's Itaipu dam suffered a 240% overrun - and took an average of 8.2 years to build. In the vast majority of cases, they say, megadams are not economically viable. But after a two-decade lull, large dams are once again being trumpeted as a ticket to prosperity. Countries from China to Brazil, via Pakistan and Ethiopia, are rushing to erect them. With world electricity consumption expected to grow by more than 56% between 2010 and 2040, according to the 2013 International Energy Outlook report, hydropower is a tempting option. More than 90% of the world's renewable electricity comes from dams, according to the International Commission on Large Dams. Andy Hughes of the British Dam Society points to Laos and Vietnam as shining examples of dam-building countries that have harnessed hydropower. "They're building dams, they're generating hydropower, and then they export that power to other countries, so it's a big cash crop for them," he says. But Bent Flyvbjerg, principal investigator for the Oxford University dam study, says dams "are not carbon neutral, and they're not greenhouse neutral". The vast quantities of concrete required to construct leave an enormous carbon footprint, he says. His argument is not with all dams though, but with megadams. "We don't accept that it's a discussion of hydropower from large dams versus fossil fuels. We would like the discussion to be about hydropower from large dams versus hydropower from smaller hydropower projects," he says. Others, such as Peter Bosshard of environmental campaign group International Rivers, say climate change threatens to alter weather patterns in unpredictable ways. "So if you put all your energy eggs in one big dam, you're taking a big risk because you don't know what future rainfall patterns will be over time," he says. The cost of these behemoths is the main focus of the Oxford study. Flyvbjerg says he expects the $14.4bn (£8.7bn) price tag for Brazil's Belo Monte dam to surge to $27.4bn (£16.5bn), outweighing any benefits, and saddling the country with a mountain of debt. At least Brazil's economy is robust. For many emerging economies, massive dams spell disaster, Flyvbjerg says. Some countries take out large loans - often in foreign currency, making them vulnerable to exchange rate fluctuations - and when dams don't deliver the promised benefits, these nations take a huge hit. "It's like a bull in a china store - these projects are way too big and way too risky to be taken on by the most fragile economies in the world," he says. Even when a dam project is overrunning and costs are soaring, governments are reluctant to scrap them he points out. "A dam is really a useless asset if it's not completely finished. Even if it's 99% finished, you can't use it - it's either on or it's not," Flyvbjerg says. But Andy Hughes says dams have many upsides. Critics should ask themselves a number of questions, he says: "How else would one generate power, how else would one give people clean water to drink, how else would one irrigate farms, how else would one treat sewage?" He says they can play an important role in mitigating climate change. During drought conditions, the reservoirs provide drinking water and irrigation. During wetter periods they're key for flood protection. In fact, Hughes predicts an upswing in dam building after severe flooding across the UK in the winter just gone by. Julia Jones, an Oregon State University hydrologist, says this chimes with her study of dams in the Columbia River basin in the Pacific Northwest. As families slept, the raging torrent smashed into their homes, killing them instantly and washing away all but the faintest traces of scores of buildings. The body of one victim was reportedly found 18 miles downstream of his home while, in Malin Bridge alone, 102 people were killed, including 11 members of one family. "There's been a net increase in the availably of water during scarce times and the protection of places during flooding times, which is exactly what the dams were intended to create," she explains. "That suggests that there is resilience and that there may be capacity large enough to deal with future climate change." But it all depends on how big the impact of climate change is, she notes. The real benefit of dams may simply boil down to perspective, according to Jones. "It all depends on who's at the table," she says. "There has been a lot of controversy for half a century or more about the larger context in which these projects are constructed - that is, who loses their livelihoods, who gains from the construction of the dam and the environmental benefits and costs." For Hughes, it's more of a damned-if-you-do-damned-if-you-don't trap. "My view is that dams can never win. If we build a dam, we get criticised, but once the dam is built people say, 'Well, what was all the fuss about? Isn't this a beautiful setting for walking around the lake and picnics?' But try and demolish a dam, and you get criticized for damaging that beautiful environment. So it's a no-win exercise, I'm afraid."